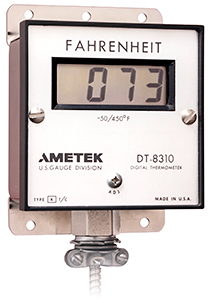 The AMETEK DT-8300 Digital Thermometer is a rugged, field instrument designed for dependable, worry-free temperature measurement anywhere in the plant. This unique device can be used with any Type K thermocouple to provide quick, convenient, continuous monitoring of liquid and gas processes. The DT-8300 is ideal for use in hard to reach places such as overhead pipes since it can be mounted remotely from the sensor by use of thermocouple extension wire. Four configurations provide for wall, pipe, panel, or stem mounting. The stainless steel housing and one piece VALOX® bezel/face provide a corrosion resistant package for harsh environments. This device performs reliably over a wide ambient temperature range. The large, easy to read LCD temperature indicator features low power and open sensor indication. A battery powered version is available incorporating commercially available size AA batteries for approximately 1.5 years of continuous operation. An external power model is also available for operation with an unregulated 6 to 28 VDC power supply. The DT-8300 is also inexpensive option to measure temperature, priced far less than comparable electronic field temperature instruments.